There is a seafood dish for any occasion and all tastes, and we have a vibrant collection of fish recipes and seafood recipes that will have you almost smelling the sea air. 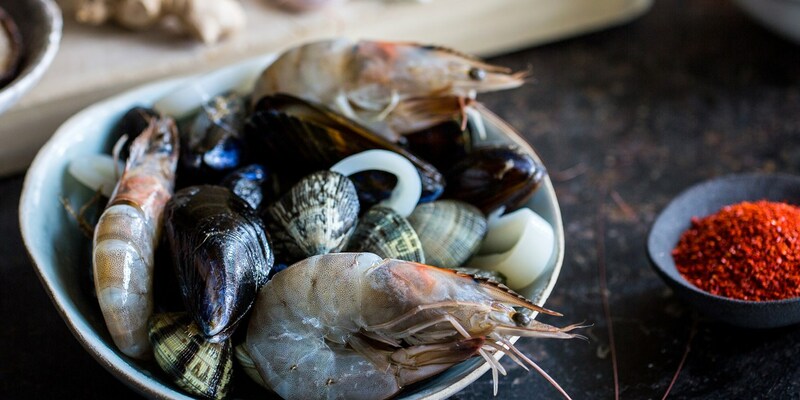 Perennially popular, seafood can be used in dishes for cold winter nights, light summer lunches and everything in between. When it’s cold and our menus lean towards the robust, try incorporating richer, more strongly flavoured seafood into comforting winter warmers - Tom Aikens’ Fish pie recipe is a perfect example, or the Galvin brothers’ Mediterranean fish soup. If you are looking for something a little more refined - albeit equally comforting - try William Drabble’s Poached lobster tail recipe, or Marcello Tully’s rich Scallop mousse, which comes with a creamy fish sauce. During the warmer seasons lighter dishes are preferable. Try serving some plump white wish with seasonal vegetables, like Mark Jordan’s Pan-fried sole with Jersey Royals recipe, or Simon Rogan’s Hake fillet with golden beetroot salad. Mediterranean flavours work well - Francesco Mazzei’s Lobster spaghetti is a fantastic seafood pasta recipe, while Andrew MacKenzie’s Seafood risotto is made all the more striking with the use of squid ink. Seafood can be a great addition to a low fat diet, too - Adam Gray’s Low-fat fish stew, made with tomatoes and paprika, is a fantastic healthy seafood recipe, and Anna Hansen’s healthy Salmon sashimi recipe is equally easy to prepare.